A short haul weekend trip is nigh on impossible to traverse without a faint sense of dread, panic and stress. Leave all that behind as I take you on a tour that very much impersonates one that could be described as whistle stop. Welcome to 24 hours in Barcelona. The city of Barcelona has a proud and long history of independent thinking, economic strength, and cultural significance. Classified as an Alpha City by the Globalization and World Cities Research Network, it is a major economic power in Southwestern Europe, even with current diplomatic problems. Despite the city itself being home to only 1.6 million people, visitor numbers reached 32 million last year – 8 million staying in hotels – leading to the local government imposing levies on new hotels and a limit on the number of beds on offer. Not to worry, though – there are still an estimated 75,000 hotel beds, along with 50,000 in legal tourist apartments, and another 50,000 in slightly-less-than-legal ones. Any traveller worth their weight in plane tickets will know that it’s well-advised to pre-book any of the attractions in Barcelona. 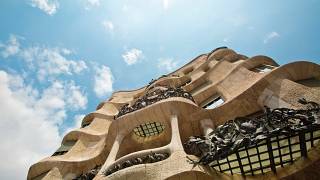 Of particular importance are the modernist works by Antoni Gaudí, arguably the world’s first ‘Starchitect’. Understandably seen as his greatest work, Sagrada Família, the famously-unfinished cathedral dedicated to the Holy Family, was started in 1882 and is due for completion in 2026. Fully aware that very little of Sagrada Família would be completed in his lifetime, Gaudí built vertically instead of horizontally, finishing the Nativity Façade of his masterpiece before his death in 1926. Tickets start from €15: incredibly good value for a closer look at the intricacies of Gaudí’s genius, and entrance into one of Europe’s most surprising and stunning interiors. If you have a sudden, understandable urge to find fish pastes from a gratuitously wide range of genera, you’ve come to the right place. As a sea port, Barcelona’s seafood is, of course, outstanding, but Lata Barra (literally ‘tin bar’), five minutes’ walk from Sagrada Família, specialises in fishy tinned goodness. For my part, I’ve never been a fan of piscatorial purée, but the sharing platter, a smorgasbord of salmon, tuna, anchovies, capers, olives, tomato – along with a formidable jug of sangria – was the perfect pick-me-up. I then decided, perhaps unwisely given the heat, to walk up the steady incline to Gaudí’s other world-famous landmark. Park Güell is named after Spanish entrepreneur Eusebi Güell, the man who handed the design of his new park over to the fastidious Gaudí in 1900, and is packed to the brim with architectural pearls. Pre-booking here is a must, as entrance times are organised to the hilt, and any hubris will be immediately punished with an embarrassing wait. If the worst happens, and you can’t get in, a walk on the paths surrounding the park is a pleasant alternative, with unrivalled views of Barcelona below. It’s worth just meandering through the inner city’s streets too, as you’re more than likely to find something of architectural importance only a few steps away – Barcelona is the only city to have been awarded the Royal Gold Medal by the Royal Institute of British Architects, usually given in recognition of an individual or group contribution to architecture. To process as many modernist buildings as one human possibly can in the space of 120 minutes, take the 2-hour Sandemans Gaudí and Modernisme tour, where a clever-clogs guide will take you through the highlights of a city brimming with Catalan modernist treasures. No rest for the wicked. Next, head along Spain’s most famous road, La Rambla. Comprised of five avenues (therefore sometimes known as Las Ramblas), the street is lined with flower stalls and street food venues, along with the less-charming but ever-present salesmen offering mementos to gullible tourists. The cheap keyring in the vague shape of Gaudí’s face was my favourite, and almost had me reaching for the shrapnel in my pocket. Also on La Rambla is La Boqueria , one of the most famous markets in the world, and first mentioned in the year 1217. Be careful not to spend too much time in here, as there’s enough going on to take up your entire day. Here, you have two choices. The first is to take the L3 Metro to Camp Nou , FC Barcelona’s home and the largest football stadium in Europe. A tour of the ground costs €25, but is well worth it for any fan of the beautiful game. If you decide to stay more central, La Rambla takes you neatly to the Gothic Quarter. The centre of Barcelona’s old city, the quarter is one long, medieval path to disorientation, wonder and strong calf muscles. Every turn leads into a small bookshop such as Llibreria Rodés , unassuming wine bar Zona d’Ombra, or gothic building hidden by the high, imposing walls surrounding it. Make your way along Carrer del Bisbe to find the beautiful Pont del Bisbe, or Bishop’s Bridge, built in 1928 by Joan Rubió i Bellver. Try to spot the skull and dagger, built into the bridge by Bellver in retaliation to the government’s decision to halt his other projects. If you find yourself lost, look for blue sky and you should make it to the coast and La Barceloneta, with its award-winning beaches. Natural beaches they certainly are not – built for the 1992 Summer Olympics, the 4.5km coastline consists of seven coves, boasts some of the best restaurants in the city, such as the aptly-named Restaurante Barceloneta, specialising in Catalonian and Mediterranean seafood (open from 1pm). If a coastal dinner doesn’t take your fancy, you could do much worse than a meal at Blanc, one of the restaurants located in the Mandarin Oriental hotel, headed by superstar chef Carme Ruscadella with five Michelin stars to her name. Remember that locals don’t usually dine until 10pm at the earliest, so fill up on tapas and churros during the day if you’re the type to be famished by early evening. Finally, stumble into a rock or jazz club such as Guzzo Club, where, if you’re lucky, the house band should be in the swing of a jam session. Guzzo is open until 3am on a weekday, and 3.30am at the weekend, which gives you plenty of time to hail a taxi to the airport for your flight home. 24 hours in Barcelona? Sorted.